Previous PostWorking away, making some progressNext PostSo what’s taking so long? Anyone have a problem with the GBS-8200 or GBS8220 running the screen pink after a few minutes? I have a number of these cards that are all doing this in EGA mode. Haven’t a CGA signal to try at the moment so don’t know if this is specific to EGA. The game I am trying to run on LCD is Atari RUSH THE ROCK. I’ve tried the 680R resistor on the Sync line. Suggestions welcome – I have five boards all doing the same thing both with the game and my Sencore Video Signal Generator (EGA setting 25Khz and 60Hz). Further testing with my Sencore signal generator – the same boards running CGA input with the same LCD monitor do NOT turn pink, colours are stable. This is definitely related to the EGA mode as far as I can tell. EGA sync (composite) is 25KHz and 60Hz. The card does not work if the sync is separate – “No Signal”. 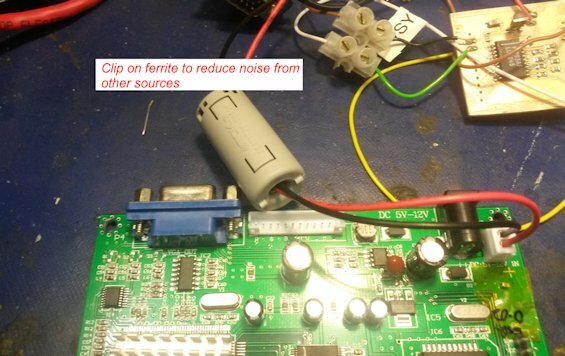 Update – the problem was traced to the CLAMP settings after all. That fixed my board issue of it turning pink after a little while in an Atari RUSH THE ROCK. Just a final note, I checked a few other of our 8200s that had notes on them (turn pink) and all are working properly now as long as the Clamp settings are changed to around st=56 and sp=61 on 25KHz EGA inputs. This is some of the best work on the GBS-8200 I’ve found. Thanks for sharing. I’m very curious to know if you ever completed the Arduino Nano automatic settings optimizer you mentioned at the end of the post? BTW, can you tell me where on the board you tapped the I2C signals? I’m tempted to hook it up to my Bus Pirate and do a little snooping/injecting myself. I looked at the datasheet for the chip and it certainly does appear that the GBS-82XX implementation doesn’t take advantage of all the features and capabilities of the chip. Anyway, I’m looking forward to your future posts on this topic as well as seeing what you’ve found on the new boards you mentioned. Sorry, one more question. You seem to imply that using a 3.3v 5v level converter is actually a better option than the 680 Ohm resistor in the sync line. Is that the case? I do have a handful of those level converters in my parts bin so I’d use one if it’s the better option. Is it OK to pull the 3.3v power for the converter from the output of the onboard 3.3v regulator? Also you mention that leaving the unused portion of one of those level translators is bad and can induce noise. What’s the fix? Can I simply desolder the components from the unused section of the board? Tie something to ground or VCC? What? Hi, catching up with comments. Using a level translator is better as the edges of the sync signal do not get rounded as much, this helps reduce pixel jitter. 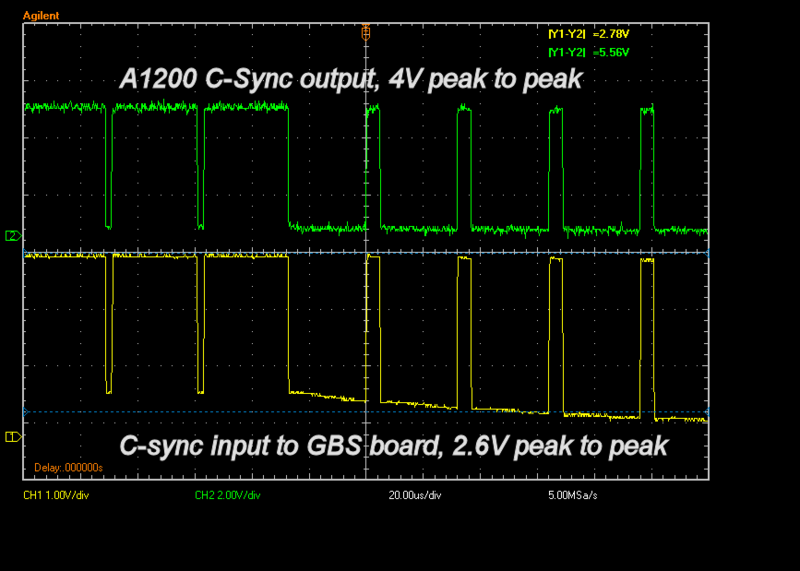 It is safe to take some 3.3V power from the GBS-8200 board. 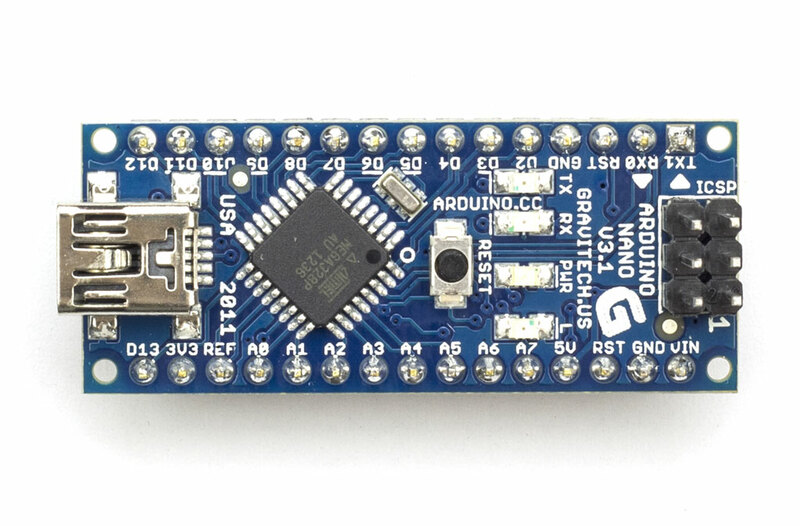 IF you are using one of the 2/4 channel 5V/3.3V board for Aruino, you can leave the unused inputs floating. I used a TTL logic device, they definitely need unused inputs tied, the Arduino adaptor board use Field Effect Transistors (FETs) which are Ok. I recently received my own board and I thought you might find this interesting. 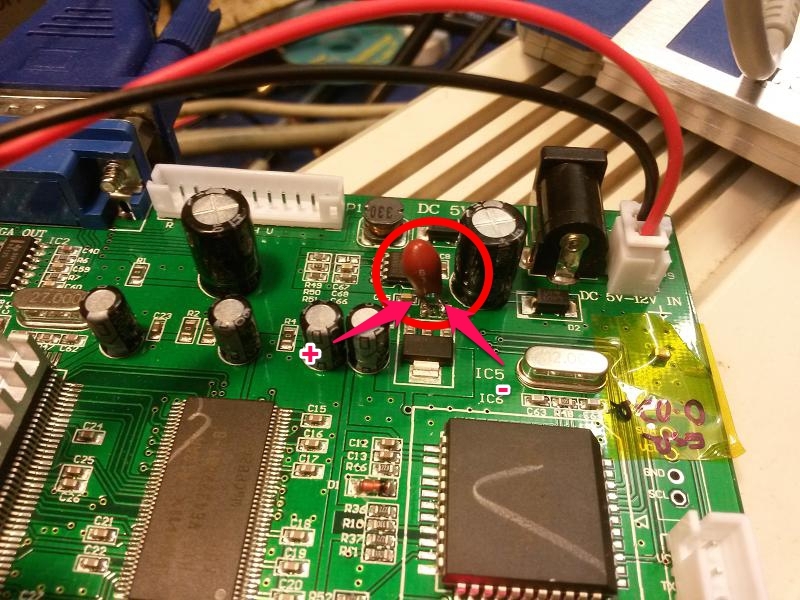 It’s silkscreen says it’s an HDS-9200 Rev 5 board from January 2015. It’s still a single output and essentially identical to your v4 GBS-8200 board. Also, based on your load testing and recommendations I used one of the micro USB breakouts from my parts bin (so handy since everyone has a crap ton of 5V Micro USB wall worts kicking around). You can see it in the picture soldered right onto the included power cord. I’m using a NOS 1.5A 5v Blackberry wall wort so far without issue. That said, I haven’t yet hooked up any input. Going to build the Amiga video cable tomorrow. Note, stupid Tinypic ignored the orientation tag in the image and displays it upside down. Sorry. I got my GBS 8200 working now, but it suffers a lot from yellow speckles like you describe. 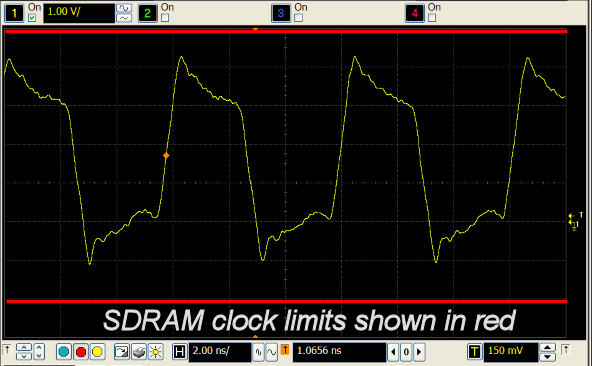 Your method to to reduce the SDRAM clock speed to 129.6 MHz looks interesting, but I have no clue at all how to connect and perform the setting change. I’m not asking for a full tutorial, but can you point me in the right direction?